In acute myocarditis, thrombus formation is an important prognostic factor. Early diagnosis and treatment of intracardiac thrombus is critical, especially when there are multiple thrombi. When a patient presents with multiple cardiac thrombi not only cardiac disorders, but other diseases such as malignancies, rheumatologic disorders and thrombophilia must be considered in the differential diagnosis. Although the presence of hypercoagulable states does not generally affect the treatment choice, it may have an impact on continuation and duration of the anticoagulant therapy. In this paper, we present two cases of acute myocarditis with multiple intracardiac thrombi. Additionally, these cases had hypercoagulable states which might have contributed to the thrombus formation. Intracardiac thrombus may develop as a consequence of multiple underlying cardiac disorder affecting valves and myocardium. The presence of a hypercoagulable state may contribute to the formation of multiple cardiac thrombi and may have an impact on the duration of anticoagulant therapy. We present two cases of acute myocarditis with concomitant hypercoagulable states and multiple intracardiac thrombi. A previously healthy 43-year-old male patient was admitted to our outpatient clinic with complaints of progressive shortness of breath and leg swelling, from which he had been suffering since the flu-like disease he had three weeks earlier. Physical examination revealed bilateral rales at lower lobes, and pretibial edema. ECG showed sinus tachycardia (112/bpm), with no ischemic changes. Complete blood count and routine biochemistry were unremarkable. 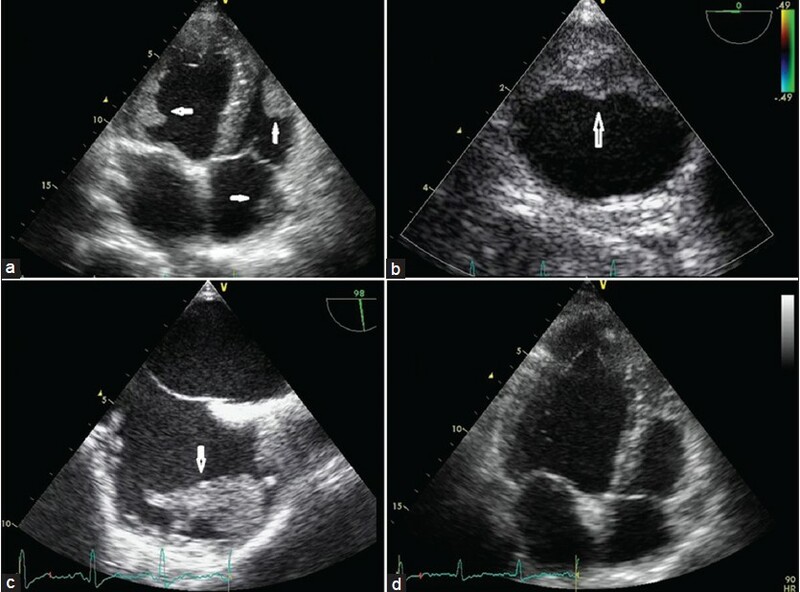 Two-dimensional echocardiogram revealed a dilated left ventricle (LVED: 63 mm, LVES: 55 mm) with severe diffuse hypokinesis, depressed left ventricle ejection fraction (30%, biplane Simpson method), mild mitral and tricuspid regurgitation, and multiple thrombi: Apical thrombi in both ventricles with the left ventricular apical thrombus and mobile, a mural left ventricular thrombus, and a right atrial thrombus [Figure 1]a-c. Cardiac thrombus and/or dissection image in the right anterolateral wall of the thoracoabdominal aorta was also observed. Transesophageal echocardiogram (TOE) was performed which revealed a thrombus or intramural hematoma with mobile particles in the posterior wall of the descending aorta and dense spontaneous echo contrast in the descending aorta [Figure 1]b. After the blood samples had been obtained for the thrombosis workup, anticoagulation with unfractionated heparin (UFH) was started. Heart failure treatment, including carvedilol, perindopril, spironolactone, hydrochlorothiazide, and indapamide were also initiated. Thrombosis workup revealed a serum homocysteine level of 57.5 μmol/L (normal range 6-17 μmol/L) and mildly elevated IgM anticardiolipin antibodies at 12.7 (URL 12). Twelve hours later the plasma homocysteine level was still elevated at 50 μmol/L. During the differential diagnosis, Behcet's disease and other rheumatologic disorders were ruled out. Screening for occult malignancy was negative. Seeking for a genetic predisposition of hypercoagulability, the patient was screened for relevant mutations and found heterozygous (C677T) for Methylene Tetrahydrofolate Reductase (MTHFR) gene mutation. Thus, the patient was discharged with warfarin therapy at a compensated status. A follow-up transthoracic and transesophageal echocardiogram at one month, showed no evidence of residual thrombus [Figure 1]d. Left ventricle was within normal dimensions and ejection fraction (54%) was close to the normal. A 59-year-old male patient with a history of atrial fibrillation and cerebrovascular accident presented to the emergency room with pulmonary edema. Myocardial infarction was ruled out by cardiac enzymes screening and ECG recordings. Transthoracic 2-dimensional echocardiogram showed global hypokinesis of the left ventricle, depressed ejection fraction (35%), biatrial dilatation, moderate mitral regurgitation and multiple intracardiac thrombi. 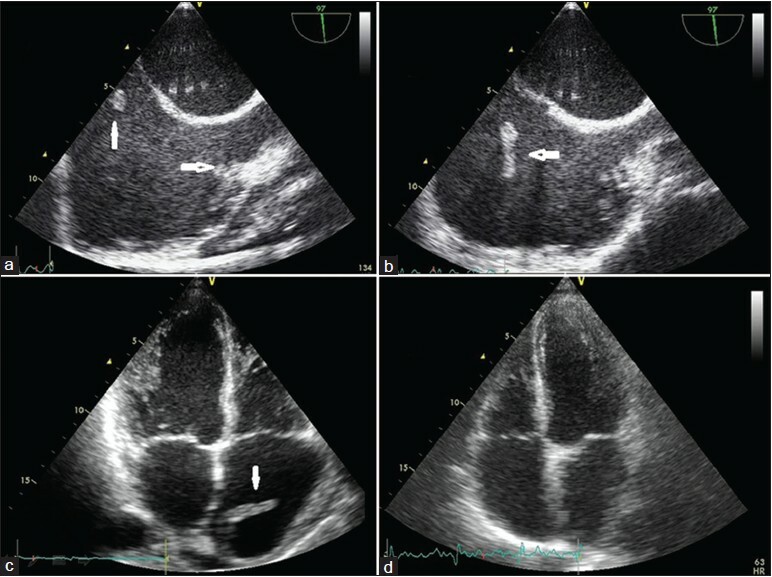 Transesophageal echocardiography confirmed multiple thrombi: A 1.6 × 1.5 cm mural thrombus in the right atrium near the superior vena cava and a 1.5 × 0.8 cm thrombus in the right atrium near the inferior vena cava [Figure 2]a-c. Deep vein thrombosis was ruled out by bilateral lower extremity venous Doppler ultrasound. After the blood samples had been obtained for the thrombosis workup, anticoagulation with unfractionated heparin (UFH) was started (target aPTT: 50-70 ms). Heart failure treatment with ramipril, spironolactone, atenolol and digoxin was also administered. He had two episodes of fever occurring two days apart. Empiric antibiotic therapy with ceftriaxone was initiated. Blood culture results and malignancy screenings were negative. Rheumatologic disorders were also ruled out. The patient was screened for acquired and/or inherited thrombophilia and found homozygous for MTHFR (A1298C) mutation. Lysis of the thrombi, with UFH therapy, was followed up by repeated transesophageal echocardiograms. UFH was withdrawn two weeks later upon disappearance of all intracardiac thrombi [Figure 2]d. The patient was discharged with enoxaparin 6000 twice a day, maintenance therapy. A follow-up transthoracic echocardiogram at six months showed a nearly normal ejection fraction (50%) of the left ventricle, with no evidence of residual thrombus. Multiple chamber thrombus formation has been reported in myocardial infarction  and various cardiomyopathies, , but more frequently it was described in acute myocarditis,  and in case of systemic inflammation and/or hypercoagulable states. There is increased risk of thrombus formation in acute myocarditis due to inflammation and stasis secondary to the decreased systolic function. Using video cardioscopy, thrombus incidence rate was shown to be higher in acute myocarditis compared to myocardial infarction and dilated cardiomyopathy, although the ejection fractions did not show any difference between the groups. It should be noted that video cardioscopy is more sensitive than echocardiography in determination of the left ventricular thrombus. In both our cases, multiple intracardiac thrombus formation can be explained by inflammation and hypercoagulable states. Our first case had hyperhomocysteinemia and was heterozygous for MTFHR (C677T) mutation. Presence of these hypercoagulable states may contribute to the thrombus formation in the heart chambers and descending aorta during acute myocarditis. Our second patient was homozygous for MTFHR (A1298C) mutation. This mutation does not cause hyperhomocysteinemia, moreover no relation between this mutation and thrombosis was found in large population studies. Since in our patient intracardiac thrombi was not resolved despite warfarin use and therapeutic INR values and persisted under parenteral anticoagulation, we suggest that MTFHR (A1298C) mutation should be taken into consideration as a possible predisposing factor to the thrombus formation. In case of multiple cardiac thrombi, diseases other than cardiac disorders, such as malignancies, rheumatologic disorders and inherited thrombophilia, must be included in the differential diagnosis. Although the presence of hypercoagulable states generally does not affect the therapy choice, it can have an impact on continuation and duration of the anticoagulant treatment. Namely, these patients may require more aggressive anticoagulation. 1. Porter A, Kandalker H, Iakobishvili Z, Sagie A, Imbar S, Battler A, et al. Left ventricular mural thrombus after anterior ST-segment-elevation acute myocardial infarction in the era of aggressive reperfusion therapy-still a frequent complication. Coron Artery Dis 2005;16:275-9. 2. Falk RH, Foster E, Coats MH. Ventricular thrombi and thromboembolismin dilated cardiomyopathy: A prospective follow-up study. Am Heart J 1992;123:136-42. 3. Koç M, Sahin DY, Tekin K, Caylý M. Development of biventricular large apical thrombi and cerebral embolism in a young woman with peripartum cardiomyopathy. Turk Kardiyol Dern Ars 2011;39:591-4. 4. Thuny F, Avierinos JF, Jop B, Tafanelli L, Renard S, Riberi A, et al. Massive biventricular thrombosis as a consequence of myocarditis: Findings from 2-dimensional and real-time 3-dimensional echocardiography. Circulation 2006;113:e932-3. 5. Kim MJ, Hur SH, Lee YS, Hyun DW, Han SW, Kim KS, et al. Intracardiac multichamber thrombi in a patient with combined protein C and protein S deficiencies. Int J Cardiol 2005;100:505-6. 6. Uchida Y, Uchida Y, Sakurai T, Kanai M, Shirai S, Nakagawa O. Cardioscopic detection of left ventricular thrombi. With special reference to a comparison with left ventriculography and echocardiography. Circ J 2011;75:1920-6. 7. Antoniak S, Boltzen U, Riad A, Kallwellis-Opara A, Rohde M, Dörner A, et al. Viral myocarditis and coagulopathy: Increased tissue factor expression and plasma thrombogenicity. J Mol Cell Cardiol 2008;45:118-26. 8. Gerdes VE, Hovinga HA, ten Cate H, Macgillavry MR, Leijte A, Reitsma PH, et al. The amsterdam vascular medicine group. Homocysteine and markers of coagulation and endothelial cell activation. J Thromb Haemost 2004;2:445-51. 9. Uçar F, Celik S, Ovali E, Karti SS, Pakdemir A, Yilmaz M, et al. Coexistence of prothrombic risk factors and its relation to left ventricular thrombus in acute myocardial infarction. Acta Cardiol 2004;59:33-9. 10. DeGroat TS, Parameswaran R, Popper PM, Kotler MN. Left ventricular thrombi in association with normal left ventricular wall motion in patients with malignancy. Am J Cardiol 1985;56:827-8.